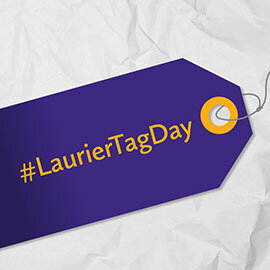 Between March 16 and 19, hundreds of tags will appear across Laurier's Waterloo and Brantford campuses in celebration of Laurier Tag Day. These tags are placed around campus to showcase and recognize the areas that have received donations and have been made possible through donor support. While not all of the items provided through donations are tagged, every tag highlights the many ways in which donations and philanthropy positively impact our university and the student experience. This celebration builds awareness within the Laurier community about the many benefits that we may not see or think about but that impact us positively on a daily basis. These enhancements provided through the generosity of our alumni, students, faculty, staff, parents and friends help make the Laurier experience exceptional. “Imagine our Laurier without scholarships, cozy study spaces, active learning classrooms, online journals, or our statue of Wilf. Thanks to thousands of Laurier donors who donate millions of dollars every year, we don’t have to,” said Victoria Gee, fourth-year Communications student and Student Alumni Association President. Did you know that half of Laurier students rely on financial aid? Check out more of our "Did You Know" posters around campus. In a time of increasing financial challenges, donations to the university are ever more important. Join us in celebrating our donors for their leadership and their investment in Laurier. Tag…you're it! Show your support by following the conversation at #LaurierTagDay and by checking out the Student Alumni Association’s blog about Tag Day. To make your own gift to Laurier, visit wlu.ca/giving.